Bob Dylan and his eternal tour arrived at the O2 in Dublin last Tuesday night, attracting a crowd of all ages. Many were avid fans and some I spoke to were simply there be in the presence of a living legend who is still hard at work at the age of 73. Since 1998, Dylan has been on the road touring, his 35th studio album ‘Tempest’ was released in 2012 and his 10th Bootleg Series released in 2013. 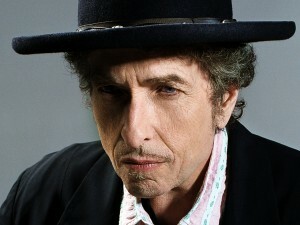 Dylan is renowned for unpredictable live shows, rarely plays his songs in recognisable form and often adjusts the pace if he thinks the Band are becoming comfortable. During a Dublin show back in 2008 he received little praise for mumbling all his songs and playing with his back to the audience, however in 2011 he returned and played well with Mark Knopfler (Dire Straits) on the same stage. Even still, reviewers and punters alike we look forward and are curious to hear what the old man and his band can offer. Opening amidst darkness with no support act, the audience in the standing area moved closer to the stage and the band stepped out, were all dressed in similar to Dylan attire of grey-black suits and hats. He eased us in with ‘Things Have Changed’, and ‘She Belongs to Me’ which was hard to recognise save for the lyrics. ‘Beyond Here Lies Nothin’ was sung in a subtle low-key style, with the odd growl here and there. He seemed to be in really good form, and was not playing his guitar. Taking a break after the well sung, barely recognisable ‘Tangled Up in Blue’ and ‘Love Sick’ he took a return to form. After a long interval, he returned again to a jazz styled stage and took us on a journey through ‘High Water’. ‘Simple Twist of Faith’ raised a cheer from the audience, he played his harmonica as best he could, a lovely authentic sound that made a lot of people stand up and applaud. ‘Pay in Blood’ had a faster, country and western vibe. After this the latter were hard to make out ‘Forgetful Heart’ and ‘Scarlet Town’. My personal favourites from Dylan on the night were ‘She Belongs To Me’, Tangled Up In Blue’ and ‘Simple Twist of Faith’. At times it was hard to hear him and there was little banter with the crowd, but still Dylan may be old and beat up, but the man has some punch in him yet. Considering his relentless tour schedule, Dylan performed well this year, the Band were on form and the aisles remained full. A good concert, not the best, but to see and hear a living legend playing on form was a very pleasant experience indeed.